Be the first to share your favorite memory, photo or story of Ella Sue. This memorial page is dedicated for family, friends and future generations to celebrate the life of their loved one. 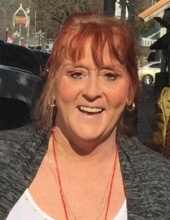 Ella Sue “Susie” Blackwell, age 55 of Carrollton, passed away Friday, April 5, 2019. She was born August 1, 1963 in Fulton County, Georgia, daughter of the late Donald W. High and Tessie Mitchell High. In addition to her father, she is preceded in death by two brothers, Hugh High and Donnie High. Survivors include her husband, Barry Blackwell of Carrollton; her mother, Tessie High; son and daughter-in-law, Jake and Shari Dawn Blackwell of Newnan, and Andrea and Jonathan Martin of Carrollton; sister, Ann Jordan of Soberton, GA; brother, Tim High of Carrollton; and four grandchildren, Emilee, Natalee, Wyatt, and Zach. Funeral service will be conducted Saturday, April 13, 2019 at 2:00 PM from Martin & Hightower Heritage Chapel with Rev. Barry Kauffman officiating. The family will receive friends at the funeral home from 12:00 PM until the hour of service. In keeping with the family’s wishes, her body will be cremated following the service. Messages of condolences can be sent to the family at www.martin-hightower.com . To send flowers or a remembrance gift to the family of Ella Sue "Susie" Blackwell, please visit our Tribute Store. "Email Address" would like to share the life celebration of Ella Sue "Susie" Blackwell. Click on the "link" to go to share a favorite memory or leave a condolence message for the family.